Although the G280 traces its heritage to North American Rockwell, Galaxy Aerospace and Israel Aerospace Industries (which manufactures the airframe), the super-midsize jet is all Gulfstream, from the design of the wing to the elegantly equipped cabin and the outstanding performance that pilots have come to expect from the Savannah, Georgia, manufacturer. Ultimately, the G280 doesn’t share much with the G200/Galaxy except the size and shape of the fuselage. The engines, wing, empennage, avionics, and systems are all new and improved, and thus the G280 required its own new type certificate. The other big difference compared to the G200 is the T-tail, which is more efficient than the G200’s cruciform-style empennage and also makes the G280 slightly longer. “We wanted it to look more like a Gulfstream,” he said. The G280’s spoilers are fly-by-wire-controlled, and this allows for automatic spoiler deployment, which facilitates steep-approach capability and the G280’s certification for London City Airport. The rudder is also fly-by-wire controlled. What buyers get with the $24.5 million G280 is a cabin nearly as wide as the classic Gulfstream fuselage, but obviously not as long. The G280 cabin measures 25 feet 10 inches in length and is typically outfitted for 10 passengers. The G450 (no longer in production) is about 15 feet longer. At 7 feet 4 inches, the G450/G550 cabin is just two inches wider than the G280’s. The G280’s 19 cabin windows (four more than the G200) are larger than the G200’s, although not the same size or configuration as those in the large-cabin Gulfstreams. “We would have had to redesign the fuselage,” he said. “They align well with the cabin interior,” and due to the large number of windows, add lots of natural lighting. The lavatory has its own window, too. One design goal was to provide access to the aft baggage compartment during flight, and this was achieved by adding an auxiliary bulkhead. The G280 has a limitation for in-flight access, which is not allowed above 40,000 feet. Trusis explained that the limitation helped simplify the certification process, but Gulfstream is now working with the FAA and EASA on removing that limit. This would enable baggage compartment accessibility up to the G280’s maximum altitude of 45,000 feet. The pressurization system delivers a more comfortable 7,000-foot cabin at maximum altitude. In late 2016, Gulfstream unveiled new cabin configurations, with two layouts offering 10 seats available for takeoff and landing without having to use the lavatory seat. One of these configurations features a double-club forward and four seats on the left side opposite a three-seat divan (only the outboard two divan seats are available for takeoff and landing). The other 10-passenger configuration replaces the divan with two individual seats in single-club orientation. An earlier popular option was eight seats, with two double-clubs, but now the most-selected option is the nine-seat configuration with the divan in the aft seating area. Club seats are berthable to create beds; the maximum sleeping capacity is five for the two 10-seat configurations. The eight- and nine-seat cabins can sleep four. The G280 cabin can be outfitted for eight, nine, or 10 passengers. Completions are all done at Gulfstream’s Dallas factory-owned service center. The lavatory features a vacuum toilet, a 10-cu-ft (0.28-cubic-meter) closet large enough to hang garments, and additional storage compartments in the vanity. The baggage compartment encloses 120 cu ft (3.4 cubic meters) and can handle up to 1,980 pounds (898 kilos). Opposite the main door is the galley, which was recently redesigned. Buyers can replace the standard convection oven with a microwave. Standard features include cold storage, coffee maker, ice drawer with a manual drain to the exterior, sink and hot/cold faucet, solid-surface countertop with pullout extension, plenty of storage, lighted display compartment, and large waste container. The Gulfstream cabin-management system (CMS) can be controlled from a master panel in the galley. A 14-cu-ft (0.4-cubic-meter) storage area is fitted next to the main door, just to the right after entering the cabin. Once in flight, an acoustical curtain can be closed, covering the main door entry and further silencing the G280’s amazingly quiet cabin. The acoustic design was accomplished by Gulfstream’s lead acoustician, who used to work for submarine-maker Electric Boat, a sister company of Gulfstream. Part of this design effort included cooling the airframe to evaluate noise performance when gaskets and rubber seals are cold-soaked to extremely low temperatures. Contributing to the cabin’s low noise levels are gaspers with built-in noise baffles. Externally, the G280 has a near-20-decibel margin over Stage 4 noise standards. Gulfstream’s CMS is controllable via an iOS app, which operates settings for temperature, lighting, and entertainment. IFE features include a forward HD monitor, dual Blu-ray/DVD players, and Gulfstream’s CabinView moving-map flight information system. Options include an additional 19-inch (48-centimeter) HD monitor on the rear bulkhead, 12-inch (30.5-cm) plug-in monitors at the seats, XM satellite radio, and Gogo Business Aviation air-to-ground and/or SwiftBroadband connectivity systems. All G280 completions are done at Gulfstream’s facility in Dallas. The G280’s engines are Honeywell’s HTF7250G, each delivering 7,624 pounds of thrust, flat-rated to ISA +15 degrees C. The engines are built with dual-channel Fadec, nacelles, and thrust reversers all in an integrated propulsion package. With a wide-chord damperless fan measuring 34.2 inches (86.9 cm) in diameter, the HTF7000 series has a 4.4 bypass ratio. The engine’s compressor airfoils were designed using straight-line-element technology, a design technique that delivers more consistent performance for machined airfoils. The combustor is a low-emissions, effusion-cooled design, and high-pressure turbine blades are transpiration-cooled. One of Honeywell’s goals for the HTF7000 series was ease of maintenance, which helps keep costs down and improves reliability. According to the company, “Individual LRUs can be replaced on average in 20 minutes or less with no shimming, rigging, or adjusting, using standard hand tools with nothing more than an idle-power leak check.” The engine is fitted with 39 “strategically placed borescope ports for 360-degree visibility” when inspecting gas path components. It’s not unusual for an airframer to opt for avionics from different manufacturers for various airplane models, but Gulfstream is keen on consistency across product lines and branded the G280’s Rockwell Collins avionics with the same PlaneView name as the Honeywell avionics in the large-cabin jets. The PlaneViewG280 avionics are the latest iteration of Rockwell Collins’s Pro Line Fusion flight deck, and a big improvement over the Pro Line 21 avionics in the G200, with three 15-inch (38-cm) displays providing much more screen real estate. PlaneView isn’t just an exercise in branding, however, as the engineers put a lot of design effort into matching Honeywell PlaneView conventions in the G280 interface. The cursor-control devices, for example, are nearly identical, with an inverse hat switch in the center for moving the cursor, three buttons for selecting the display, and a rotational knob for moving up and down checklists or ranging in and out on the moving map. The Gulfstream PlaneView280 flight deck features three 15-inch displays and unique standby multifunction controllers that double as standby displays. The center moving map looks a lot like the Honeywell equivalent, too, with similar drop-down menus, synoptic diagrams, and checklists. “We tailored the look and feel with PlaneView,” said Trusis, “including the symbology and the look and feel and functionality. We spent a lot of time trying to make sure this airplane had that familiarity with other Gulfstream products. A lot of the look and feel and operational features of the large-cabin aircraft have been designed into this avionics system.” Like the large-cabin jets, the G280 is equipped with autothrottles and the same head-up display (also a Rockwell Collins product) and Kollsman enhanced vision system as the G650. The third FMS is optional, but a popular choice. Pilots used to programming a Honeywell FMS in the larger Gulfstreams will notice some user-interface differences with the Rockwell Collins FMSs in the G280. This is no big deal, but I find the Rockwell Collins FMS a bit more intuitive. Synthetic vision is also an option on the G280, and most buyers select this, according to Trusis. Both Honeywell’s and Rockwell Collins’s synthetic vision are tremendously beneficial situational awareness tools, and most business jet pilots I’ve asked prefer it. The Rockwell Collins version adds a useful feature, an opaque airport dome that highlights the destination airport. The dome gradually becomes less opaque as the airplane gets closer to the airport. Large-cabin Gulfstream pilots should find the G280’s guidance panel familiar, but the standby multifunctional controllers (SMCs) have a G650-like twist: the large Rockwell Collins SMC display also doubles as an integrated standby instrument, driven by a remotely mounted L3 standby instrument. This is a much better design than tiny standby instruments mounted elsewhere in some airplanes, and, during an emergency situation, allows the pilots to align their viewpoint forward instead of down inside the cockpit. In case of total electrical failure, the SMCs, the integrated standby instruments, and the autopilot are powered by the standby battery. The SMCs have many other functions, including the ability to manage single-point refueling from the cockpit, instead of having to access the refuel/defuel panel mounted aft of the fueling port. Other functions include PFD settings, weather radar, chart selection, HUD settings, checklists, nav sources, avionics configurations for each phase of flight, and more. The G280 PlaneView caution and advisory system (CAS) messages are displayed in a more intelligent fashion, and overall, the G280 flight deck is thoroughly modern, uncluttered and without too many switches and knobs. Circuit breakers are all consolidated on one overhead panel and laid out in a simple grid pattern. Pilots appreciate the G280’s strong performance, especially the ability to fly coast-to-coast in the U.S. at Mach .84 (3,000-nm/5,556-km NBAA IFR range with four passengers) or even farther at Mach .80 (3,600 nm/6,667 km, also with four passengers). With a balanced field length of 4,750 feet at mtow (thanks to the autobrakes), the G280 can access a huge number of airports. Sea level landing distance at maximum landing weight is 2,740 feet. “We wanted to achieve class-leading performance for its size,” said Trusis, “and we have no problem meeting the stated performance numbers.” The G280 has secured speed records for more than 55 city pairs. The G280 can climb directly to FL430 after taking off at its 39,600-pound mtow. Chief demo pilot Brett Rundle said he has climbed to FL430 in just 20 minutes at maximum weight. The G280 has a fuel-jettison system, something not found on any other business jets (those that aren’t derived from airline airframes). This system can also be used for defueling via a special adapter that attaches to the jettison port mounted between the flaps and ailerons. The G200’s fuselage bladder tank was not retained in the G280, which has seven fuel tanks. These include tanks in both wings, three in the center section (forward, center, aft) and two feed tanks in the aft tank, each serving one engine. A single air-cycle machine supplies the environmental control system, using bleed air from the engines or APU. The Honeywell GTCP36-150 APU can be operated up to 40,000 feet. Thankfully, Gulfstream opted for a selection between Imperial and metric units on the temperature displays in the cockpit and cabin. Ailerons are mechanically driven and supported by the multifunction spoilers (the middle and outboard spoiler panels), and either flight control is sufficient for full lateral control. The force required to move the ailerons is reduced by geared tabs that help reduce aileron hinge moment. Elevators are hydraulically controlled via dual hydro-mechanical servo actuators, one for each elevator, and each with dual push rods. Separate hydraulic systems operate each servo, and each elevator is separately connected to each pilot’s control wheel. A “Q-feel” actuator in the right-side elevator control loop increases control force as speed increases. In case of total failure of the hydraulic system, the elevators can be operated manually. The fly-by-wire rudder incorporates a thrust-compensation mode in case of engine failure, and this removes 80 percent of the rudder pedal force needed to maintain the proper trajectory on one engine. This leaves some remaining rudder adjustment for the pilot, to help keep the pilot in the loop during an engine-out situation. Weight-and-balance capabilities are generous on the G280. Even with the large aft baggage compartment filled to its nearly 2,000-pound (907-kg) capacity, the G280 will stay within its CG limits with no passengers onboard. “If you take off in c.g., you’ll land in c.g.,” Rundle said. The G280 cabin door is electro-hydraulically actuated, an upgrade from the G200’s electrically driven cable and reel system. When open, the G280 door sits on the ground for maximum stability, protected by a Teflon pad where it contacts the surface. As is typical with a Gulfstream demo flight, our plan was for me to fly jumpseat for the first leg, in this case from the company’s Savannah, Georgia, headquarters to Columbia Metropolitan Airport in South Carolina, then switch seats so I could fly the return trip. We briefed the flight, then Rundle and I walked around the G280 while he showed me some of its attributes. Rundle flew right seat and domestic captain Jeffrey Dyrhaug flew left seat for the leg to Columbia. It was a typical warm summer day in the southeast U.S., with thunderstorms popping and threatening to join up later in the afternoon. The short flight to Columbia was smooth, and we didn’t climb higher than 16,000 feet. Dyrhaug demonstrated the ease of landing the G280 with a gentle touchdown at Columbia, showing me how easily the nose drops after touching down and the smoothness of the carbon-ceramic brakes. We taxied to the ramp and stopped for the seat switch. 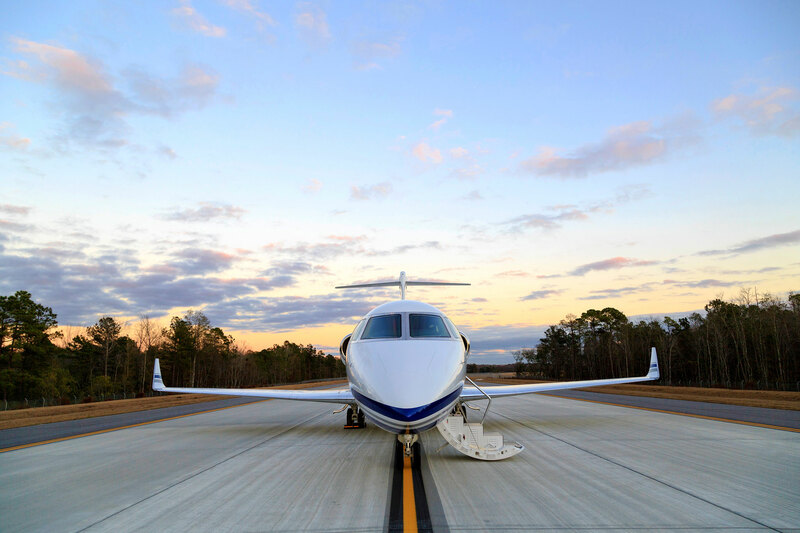 For the takeoff at Columbia, the G280’s weight was 31,833 pounds. Outside temperature was a balmy 32 deg C. The FMS showed balanced field length required of 3,554 feet, and rotation speed was 117 knots, V2 127 knots. At this weight, according to the FMS, we would be able to climb directly to FL450. To a person sitting in the cockpit, the G280 feels lower to the ramp compared with the larger Gulfstreams, and it is somewhat closer to the ground due to its trailing-link landing gear. Nosewheel steering (also electronic steer-by-wire) via the tiller was easy to operate smoothly; either I’m getting more used to tiller steering or the G280 just is more tolerant of a ham-fisted pilot, because we didn’t experience any of the herky jerky motion that I imparted when I flew the G550. Rundle explained that it’s better to use just the left thrust reverser to slow down while taxiing, to prevent exhaust smell from the right engine entering the cabin through the APU inlet. I taxied to Runway 11 at Columbia, remembering what Rundle had warned me during the briefing: “This thing clearly has a lot of power,” he said, recalling a flight from Charlotte, North Carolina, where he was given an unrestricted climb at mid-weight and held V2 after liftoff, bursting through 10,000 feet by the time the G280 reached the end of the runway. Airspeed built rapidly as I rotated, while I tried to bring the nose up smoothly and not pull too hard. The G280 responded promptly to my control inputs, and I was able to keep from pitching the nose too high as Rundle retracted the landing gear; then the flaps. ATC wasn’t able to give us an unrestricted climb, and we ended up leveling off briefly four times, but still made it to FL450 in just over 19 minutes. Temperature during the climb averaged about ISA +5 degrees C, and once at FL450 was about -5 degrees C. We climbed at 300 ktas after 10,000 feet then transitioned to a Mach 0.80 climb. At FL400, the G280 was still climbing rapidly, at 2,900 fpm. Our route of flight took us north to Spartanburg, South Carolina, then northwest past Asheville, North Carolina, where we turned back and flew over Augusta, Georgia. While in cruise, I stepped out of the cockpit to assess the noise in the cabin, and with the acoustical curtain covering the main entry, the noise level was extraordinarily low. Both Rundle and Dyrhaug could easily hear me talking in a normal tone from the back of the cabin, as I could also hear them. Closing the pocket door at the forward bulkhead cut the noise even further. The door has a porthole so crew can look into the cabin without opening the door. On the way back down, we stopped for a brief cruise performance check at FL410. Speed settled on Mach 0.82 (467 ktas), and the engines each were burning 900 pph. After descending to a cleared block of airspace below 15,000 feet, I slowed the G280 to get a feel for slow-speed handling, then flew a steep turn. By this time, the thunderstorms were looming larger and generating some turbulence, which the G280 simply plowed through firmly with no effort needed on my part to mitigate any disturbances. In the distance, we could see the growing thunderstorm painting the Rockwell Collins MultiScan radar picture red. We flew back to Savannah for the RNAV 28 approach, and I put the head-up display and autothrottles to work while hand-flying the final leg and down to a smooth touchdown in a 10-knot crosswind. The medium setting on the autobrakes brought the G280 to a firm and well-aligned stop, followed by an uneventful taxi to the Gulfstream ramp.